Between the events of Venomized, Damnation, and Avengers there were plenty of epic battles fought during the final month of the first quarter of the #FantasyComicLeague‘s 2018 Season. The Elite “S” Squad pulled no punches. This devoted group brought in a total of 447 points, which consisted of saving 9 civilians, defeating 22 adversaries and miraculously navigating 41 life changing events. #Wakanda Division Leader, Agent Sistah (@S_Hero4Hire) and her season long love affair with Falcon proved to be an ideal pairing. #TeamCosmicMelee brought in a record setting 117points for the Division, fortifying her first place position for the month. 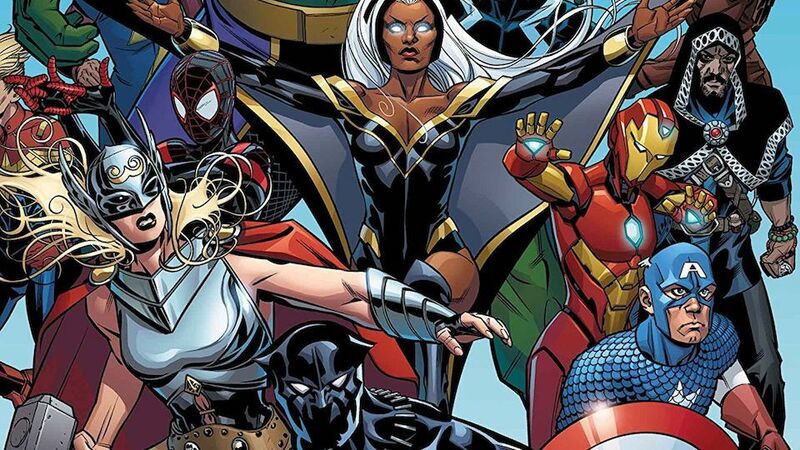 Her powerhouse duo of Sam Wilson and Peter Parker brought in 86 of her points and Agent Sistah was able to forgive a mediocre debut of Valkyrie into the #FantasyComicLeague. Agent Sha (@La_Ney_sha) brought in a rock solid 106 points to lock in a second place finish due to a one-two-combo by both Goddesses: Ororo and FosThor. Agent Sha’s beloved Storm had her first “Hero of the Week” mantle during a stellar performance the third week of the month. The Goddesses brought in 67 of Agent Sha’s points and securely proved themselves worthy of their titles. There was a hotly contested race for third place between Agent Super (@supercurrymax) and Agent Snikt (@NickZG). Keeping his mainstay, Rogue close at hand, Agent Super was able to bring in 89 points and secure third place. During the opening week of competition, Rogue earned her first solo “Hero of the Week” mantle and worked closely with draft-mates Dr. Voodoo and Clint Barton to bring in 79 of Agent Super’s points. As for Agent Snikt, he brought in 80 points and a fourth place finish. Although his bet on Valerie Vector turned out to be a worthy investment, Agent Snikt’s team was dominated by performances from T’Challa and Venom who together brought in 49 of his points. Holding down the fifth place slot was Agent Shaw (@Notingshaw) whose team brought in 55 points for #Wakanda. Her season long trusted companion, Dr. Strange, did not let Agent Shaw down. This was especially true when Dr. Strange was named “Hero of the Week” during the last week of the season. Dr. Strange contributed to 23 of her total points. All in all, #Wakanda brought in 1,364 total points into the #FantasyComicLeague this season. #Wakanda Division Leader, Agent Sistah, locked down a second season victory (back to back at that), stayed the lips of any #TeamCosmicMelee naysayers, set a new #Wakanda single month point record, and was the top performer within all division participants for the past four-month season. All praises be to both Bast and Hanuman for the blessings bestowed upon #Wakanda. The First Quarter of the 2018 session of the Wakanda Caucus has been adjourned.